Out of Nowhere | WHAT IS MONTHLY MAINTENANCE AND BACKUP? WHAT IS MONTHLY MAINTENANCE & BACKUP? We work on your site even when you don’t. Did you know that every month we make up to a dozen updates to the software on your site? In addition, we make regular off-site backups in the event something catastrophic happens to your site. Even if you aren’t changing any of your site content, your site undergoes constant change as we maintain your site software and create backups. It’s the wild wild west out there in Internet Land and all websites are constantly under attack by the bad guys who try to hack or hijack your site through vulnerable software. This is what software maintenance is all about. Software, by its nature, is always adding new features and with new features come new vulnerabilities. When the vulnerabilities are discovered, the software developers issue updates. But someone needs to apply those updates to your site and that’s what we do for you. It’s not as easy as pushing one button, however. A WordPress site is the result of the collaboration of many software developers all working independently, yet in a coordinated manner. 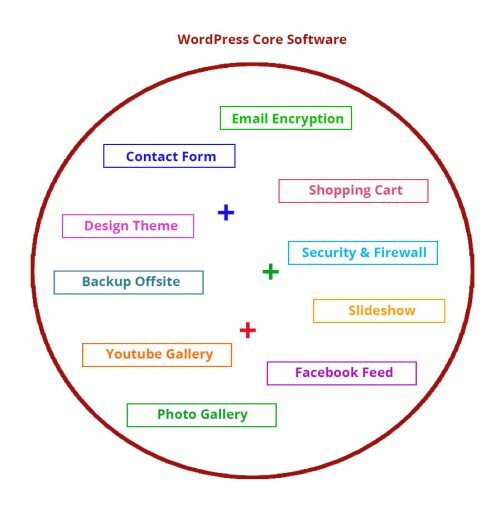 On your site, there is the WordPress Core software, the theme software (design tools), and the plugins (which offer special functionality). Look at the illustration. Each color indicates a piece of software created by a different developer. Each developer updates their software at different times. We receive at least one notice of a plugin, theme, or WordPress updated EVERY DAY. We don’t wait a week or two to implement updates because your site would be vulnerable. We update your software within a day or two of us being notified. Not performing software maintenance can have devastating consequences, from your site being hijacked and redirecting visitors to an unsavory site to having your website taken down and held for ransom. Not only is your site in danger, so are all the other sites we host on our server. When one site is vulnerable, all the sites are vulnerable. That’s why we require all sites we host to keep their software up-to-date. So if you ever wonder why you pay for maintenance even if your site isn’t changing, now you know. Do you have a WordPress site that isn’t being monitored or updated? Contact us and let us help keep your site secure.